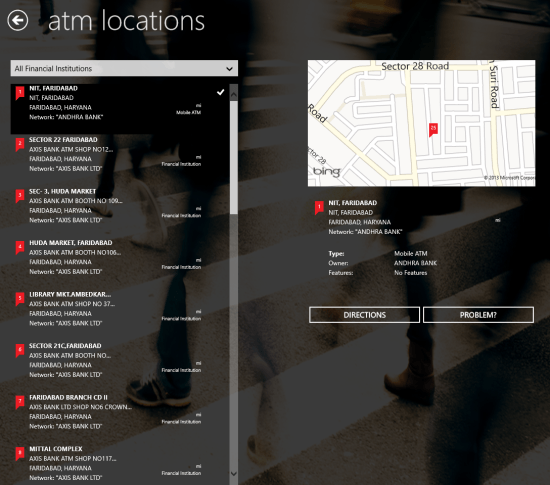 ATM Hunter Windows 8 app lets you easily find the ATMs nearby. This free Windows 8 ATM Hunter app uses your current location at input and presents you the list of ATMs, PayPass locations, and the places offering cask back offers. In addition, it also allows you to query for ATMs worldwide for any location specified by you. The ATM Hunter Windows 8 App is likely to prove handy for people travelling from one place to other. On launching the ATM Hunter for the first time you will be prompted about allowing the application to access your location. To continue, you will require to click on ‘Allow’ button. Soon, the you will be resented the similar interface as in screenshot below. As per the availability of the list of available locations will be presented to you. Now, you can click on any entry in the list to find more details and its exact location. You will also come to know that whether particular ATM is a bank ATM or an ATM in a local store, or any other. Visit the home screen and then right-click on blank region. Then a horizontal button will emerge at bottom with two buttons at bottom stating ‘filter’ and ‘Change location’. 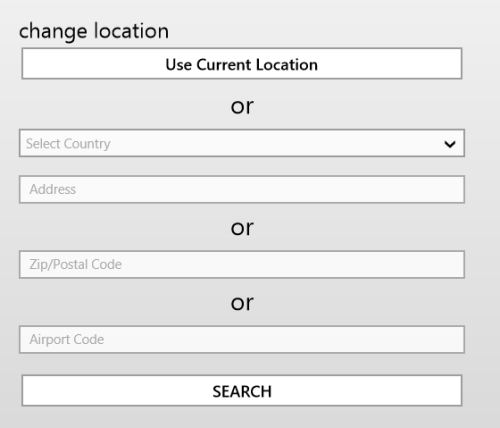 To Search for ATMs at some different location you will have to click on ‘Change Location’ button. Next, a new application window will Emerge on the screen with options to specify a location. Now, enter the details of location and click on ‘Search’ button. Rest of the process is similar as discussed previously. Also, check out our posts on Stock Market Apps, Expense Tracker Apps, and RSS Reader Apps. You can locate ATM Hunter Windows 8 app under ‘Finance’ section of Windows Store and install it from there. The more direct way would be to open this link in IE (10 or advance). 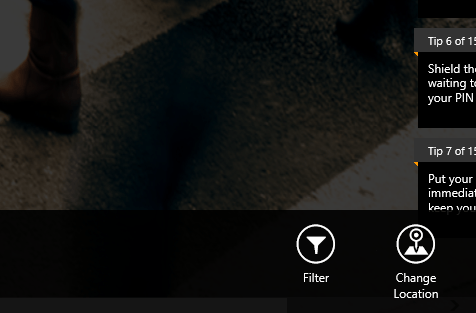 Then click on ‘View in Windows Store’ button. On being redirected,. click on ‘Install’ button. The size of the application is only 4.9 MB. The app require permission to access your location and to access your internet connection. 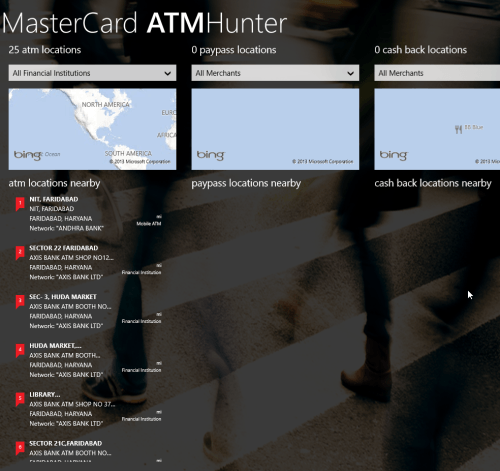 ATM Hunter is surely a nice Windows 8 App and I have no issues in recommending it.